Congrats to Dirk Nowitzki and the Dallas Mavericks for ending our season long nightmare by defeating the Miami Heat in the NBA Finals. LeBron James will have to wait at least one more season before claiming his first championship. On the ABC postgame, Jeff Van Gundy tossed out the notion that the Miami front office would possibly entertain the idea of trading LeBron or Dwyane Wade for either Chris Paul or Dwight Howard this offseason because, in his mind, the pieces just might not “fit” as currently constituted. Don’t you have to wait at least one more year before blowing the whole thing up? For me, the arithmetic just doesn’t add up on this one. LeBron will be back. Dwyane Wade will be back. 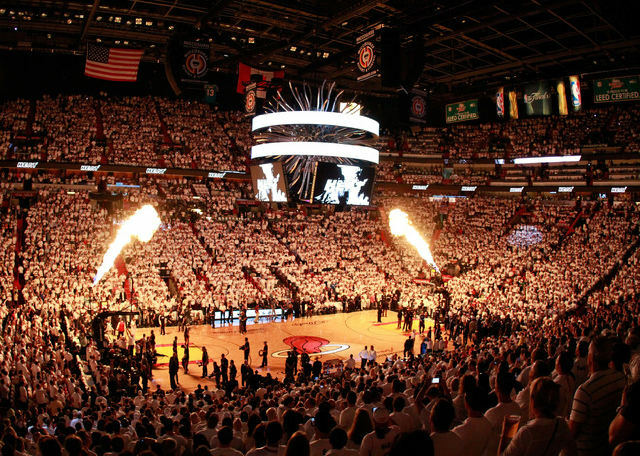 Even Chris Bosh and Coach Spoelstra will return for another season in South Beach which is what we should all want, another opportunity to root against the Miami Heat. As the curtain falls on an incredibly entertaining NBA season, and the Stanley Cup Finals stare down a Game 6 tonight in Boston, MLB is about ready to take center stage for the long summer months. And who knows, if the billionaires and millionaires that operate the NFL don’t get their s*#$ together soon, we could be looking at nothing but baseball chatter for the foreseable future. 1B – I guess we all spoke too soon about the Cleveland Indians. Losers of 9 of their last 10, the Tribe are starting to play like the team we all thought they were going to be before the 2011 season began. And now here come the Detroit Tigers and Chicago White Sox ready to make a race of the AL Central. Two questions: can the Indians hold on a little longer, say until the all star break or are they in the midst of a total free fall? Second, the Twins have won 8 of 10 and sit only 9 games out of the division lead. With a healthy(?) Joe Mauer returning behind the plate this week, does Minnesota make their traditional run to the top of the standings or are they simply snake bitten this season? 2B – Good for you Atlanta! At least we have one team willing to hang in there in the NL East and not allow the Philadelphia Phillies to sit back and map out their postseason pitching rotation starting in August. Is Brian McCann the best catcher in baseball right now? With Posey and Mauer both injured, and my main man Matt Wieters quietly emerging but not quite yet ready for prime time, McCann is probably the gold standard right now. 3B – The Chicago Cubs are not a good baseball team. Whenever Lou Montanez is batting 3rd in your lineup you know you have issues. Not only are the Cubs struggling on the field but now Peter Gammons, MLB columnist and baseball emissary especial, has called Wrigley Field a “dump” and mentioned how the new ownership group in Chicago, the Ricketts family, is not prepared financially to handle the cost of essential ballpark renovations. Of course, take anything the Boston based Gammons writes with a grain of salt. If Larry Lucchino or Theo Epstein were to go to the bathroom in the middle of Boston Common Gammons would find a way hail the masterpiece as an important work of impressionist art. HR – Derek Jeter is now 7 hits away from 3,000 and unfortunately for Yankee fans it doesn’t look like the Captain is going to reach this milestone in Yankee Stadium. I guess it’s possible, 7 hits in 4 games at home this week, but in all likelihood Jeter will reach 3K in Wrigley Field over the weekend in front of 40K over served Chicago Cubs fans. Ahhhh the memories. I had an interesting conversation with a friend on Friday night. We were talking about the NBA and Stanley Cup finals and he was arguing that the fans of these two sports are mutually exclusive. In general, his point as a hockey fan was that they don’t really care about the NBA Finals and vice versa. As an NBA fan, I felt that his argument was incorrect and incredibly shortsighted. If there were ever a time to care about both, now is that time. Even I can acknowledge the incredible cross continent fight taking place between the Bruins and Canucks. So to all those hockey fans out there who are unwilling to give the NBA Finals a chance, here are 3 simple reasons why you should care about Game 6 tonight between the Dallas Mavericks and the Miami Heat. Reason #1: The superstars play the hardest. It’s true. The best players in the game tonight – Dirk Nowitzki, Dwyane Wade, and LeBron James, are also the hardest workers. A lot of non NBA fans are turned off by the perception that all NBA players are self promoting, narcissists who thump their chests after every made layup. And although this may still be the case for some – see Chris Bosh – the majority of NBAers today genuinely care about giving their best effort. Reason #2: For hockey fans that appreciate a good rivalry, this series has all the essential ingredients . 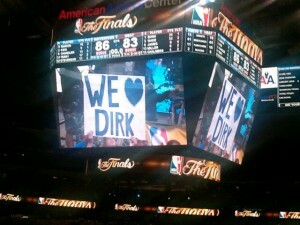 The Dallas Mavericks and the Miami Heat do not like each other. The James and Wade video mocking Nowitzki’s illness is just the latest in a long line of competitive animosity between these two sides. Wade and Nowitzki have had a rivalry since the Heat beat the Mavs in the ’06 finals and the style of these two teams couldn’t be any more different. 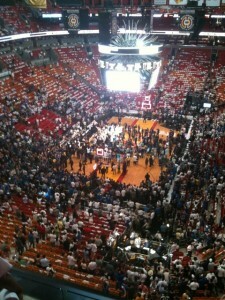 The Heat are South Beach glamor personified while the Mavs have come to symbolize veteran savy and work ethic. Reason #3: LeBron James is the most polarizing figure in professional sports today. Picture the amazing physical skills of Alexander Ovechkin coupled with the disdain for your least favorite politician. This is the complicated formula that besets LeBron as he prepares to take the court in Game 6. Publicly vilified for “The Decision” but universally lauded for his amazing basketball ability, LeBron has been unable to come through in the 4th quarter of this series when it matters the most. All of the pressure rests on his shoulders tonight. Will he help the Heat stave off elimination and send the series to a game 7 or will he head into another offseason in pursuit of his first, elusive NBA Championship? 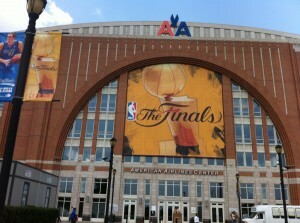 Stay tuned hockey fans, there is something for everyone in the 2011 NBA Finals. having a 4 month old son and a full time job precludes me from staying up past 9:30. 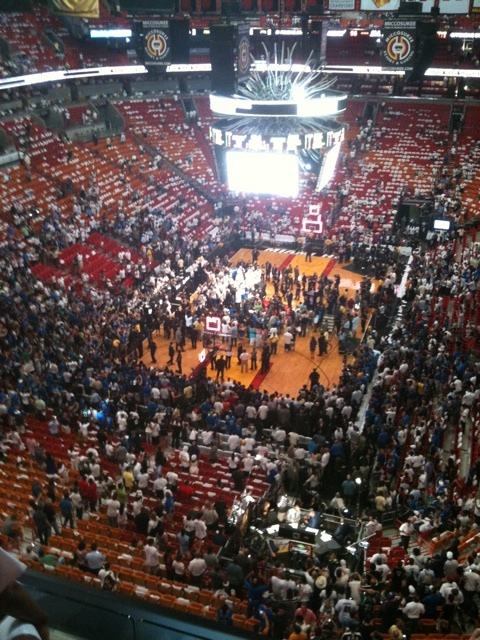 I would have loved to see the Mavs come back on the Heat and close out Game 4 in Dallas but unfortunately, I didn’t make it past the LeBron to DWade alley oop making it 67-64 Miami with only 2 minutes to go in the 3rd. After that, nighty night. How can a global audience on the world wide web take a writer/blogger seriously after they admit to not watching the 2nd half of an NBA Finals game? Sure, I could disguise my fatigue and act like I watched the whole thing but that would be disingenuous. I did last 3 months in the Cub Scouts after all. this series is going 7 and I will be too tired to remember any of it. the national sportswriters of America have gone completely schizo regarding LeBron. One morning the headlines read “LeBron is Jordan”, next day it’s “Wade Plays Alpha to James’ Beta”, and now after Tuesday night we are looking at a days worth of “Gone Missing” stories. 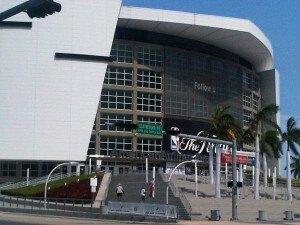 Let’s wait till the series comes to a conclusion before we etch anything permanent on LeBron’s headstone. I will say however that James scoring less than 10 points last night does shock me. Maybe Dirk’s German shooting coach Holger Geschwindner has been sending Lebron some evil eastern European vibes. Rick Carlisle is going to panic some more and start Brian Cardinal over Tyson Chandler in Game 5.
this latest heat wave enveloping the Northeast will lead to a brown out right as the puck drops for Game 5 Bruins/Canucks. Of course, with a 4 month old son and full time job, I probably wasn’t going to watch much more than the 1st period anyway. Not hard to imagine, seeing as how the diminutive Dallas backup point guard extraordinaire is often asked to show his credentials upon entering an NBA arena. Believe me, I’m not trying to pick on the 5’9″ Northeastern grad from Puerto Rico, the man has some serious “skeelz”, including showing no fear as he weaves his way through the giants sequoias en route to the basket. All I’m trying to say is that J.J., he of the fashionably metro beard from the little known land of Lilliput, could easily pass for a MD trying to fit in a quick game at the local Y between vasectomies at Columbia Presbyterian. I’m sure Barea isn’t phased by all the confusion, at least I wouldn’t be if I were dating Miss Universe 2006. Last laugh’s on us I suppose. Dirk Nowitzki can’t carry the Mavericks to a series victory. Last night, the shots Dirk was hitting vs OKC weren’t falling and down the stretch, the Jason’s, Terry and Kidd, went into early hibernation mode. 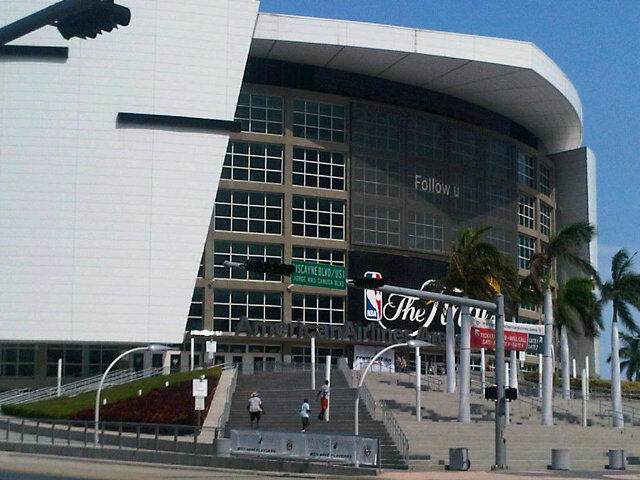 Now reports out of South Beach have Nowitzki playing with a torn ligament in his finger. Already down a game to the Heat, let the excuses begin! traveling is no longer part of a NBA officials vernacular. I understand LeBron is a once in a generation athlete but even Jim Thorpe took less than 7 steps when driving to the basket. I’m not paying enough attention to the Stanley Cup Finals between the Vancouver Canucks and the Boston Bruins. Two hockey hot cities longing for a championship. Unfortunately for the NHL, it’s June and the only ice I want to cozy up to is resting comfortably at the bottom of my mojita.